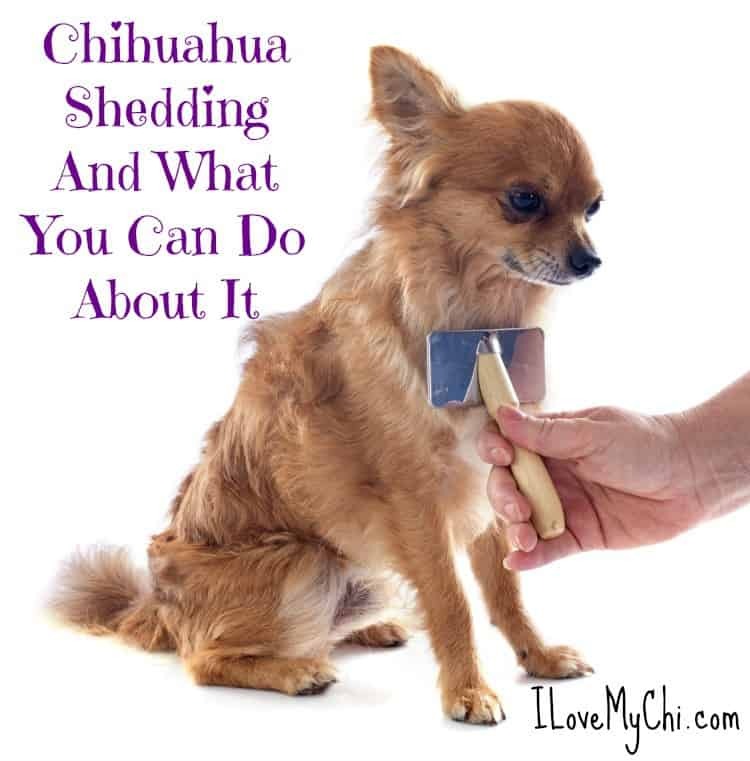 We are lucky that although Chihuahuas do shed, they aren’t the heavy shedders that some breeds are (believe me I know, I also have one of those!). Shedding is an annoyance for pet parents. It gets on your clothes, on your furniture and carpets too. I even designed a t-shirt about it. Just click the shirt photo if you are interested in checking it out. 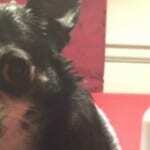 Dogs shed to get rid of excess fur, damaged fur and when the seasons change. Some dogs shed due to allergies, illness and pregnancy too. 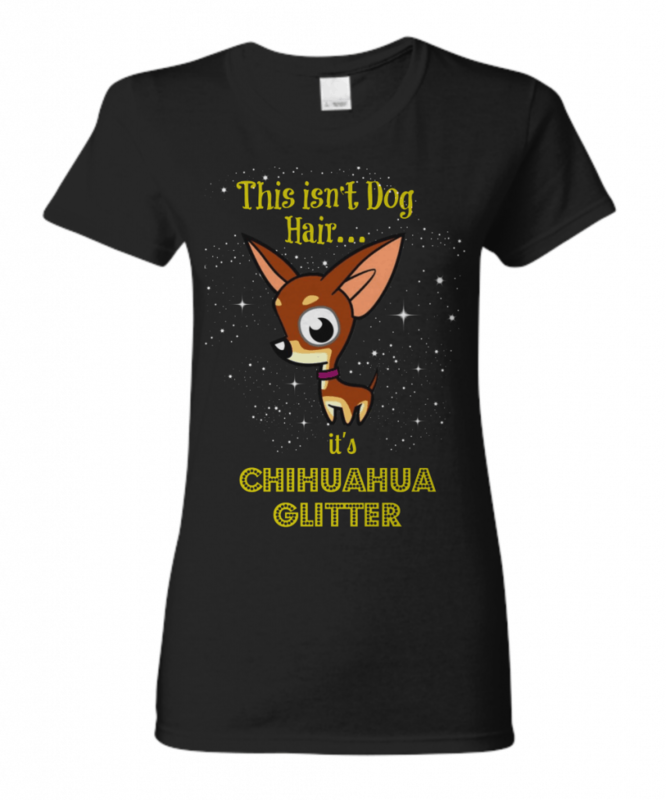 Many people think a short haired Chihuahua will not shed as much as a long haired Chihuahua. Actually it’s a little less for the long haired Chis since they don’t have the undercoat that short haired (or smooth coat) Chis have, although the hairs from the long haired Chi will obviously be longer. Chihuahuas shed all year long but they do it more in spring and summer when the weather turns hot. They don’t need as much fur then to keep them warm so they shed some of it. Some dogs will shed more than usual when they are ill or pregnant. Stress, poor nutrition, skin infections, allergies, cancer and other diseases can cause your Chi to shed more than normal. If you are seeing any bald spots or red irritated patches of skin, it’s time to get your dog checked by a Vet. 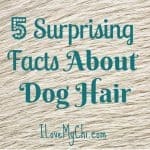 Also your dog’s hair is coming out in clumps, or falling out when you lightly pull on it, time to call the vet. 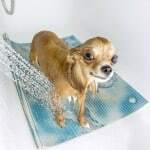 Bathe your dog weekly with a mild shampoo if shedding is becoming an issue. Brush your dog everyday. You can use a typical dog’s hair brush but I really like using a Furminator to keep the fur from getting out of control. I’m always shocked at how much excess fur I get off of Kilo when I use the Furminator. I sometimes rub coconut oil into Kilo’s skin after her bath. She really likes the massage and it’s a great way to keep her skin and hair healthy. Feed your dog a healthy diet with a quality dog food. A vitamin/mineral supplement for dogs may help too. I haven’t tried this but some people swear by shed supplements. You can check them out on Amazon here. Use a squeegee to run over your carpet to pull up the hair. I suggest using a squeegee with a long handle so you won’t have to get down on your hands and knees. Run a wet rubber glove over your upholstered furniture to easily get up the hair. My tip is to vacuum and sweep more often. Not fun but it does help. Is shedding an issue in your home? Do you have any tips you think I should add to this article? Leave a comment and let me know what they are. That’s great that she doesn’t mind Emalene. Mine would totally freak out. I do the same thing!!!! but with a regular vacuum. I just get sick of it(dog hair) and vacuum Fifi off, she doesn’t freak out, but she doesn’t love it either lol. It’s good she lets you do it Verlinda. Some do freak out. That’s a great idea Maureen. I tried a Furminator, but it seems to me that its cutting the hair, rather than just removing the hair that has shed. I’d be interested in other opinions on this. I really like my furminator. I find if I push down too hard, it does seem to cut the hair so I use a lighter touch. I love using a furminator. After trying all kinds of brushes, rubber tools and a glow that’s for short coated dogs and cats, I found a cheap version of a furminator and it works perfect. And my chi loves it. But so much fur. 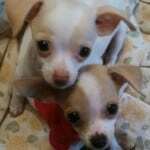 My chi is the bigger version of chihuahua so there is pretty much dog to work on. Furminators are great. It is amazing how much fur they get off. I like that you touched on possible medical issues. I have a long haired Chi and she could our shed my sled dog! My groomer said that some just shed more than others. Turns out that what we thought were all unrelated some medical issues, were all linked together and we found the answer to all of it, including the shedding! She has an endocrine immune imbalance. It made everything in her poor little body not work right. She is being treated and is doing amazing!! The shedding is barely noticeable now too! So, medical issues causing skin trouble may be more than skin deep. Interesting Christina. Is she hypothyroid or is it another type of issue? I notice that articles and comments seem to indicate that long hair chi does not have undercoat and therefore does not shed as much as smooth coats. I am totally baffled. I have a ‘found’ long hair chi and she sheds something terrible. Plus, she has a very thick undercoat which reminds me of our husky mix. Hair is all over the place, yes I use the Swiffer and go through multiple pads every day. I vacuum more than ever. Just can’t seem to get ahead of this. She loves to snuggle on my chair next to me, so I put an old sheet on her side and have a big sticky lint roller to remove hair each and every time she gets up. She is a fussy eater unless I give her plain cooked chicken, peas or carrots or sweet potato and brown rice. However, vet suggested using high quality kibble and canned which I did/do but sometimes she eats and others not. I have no idea what to do or what I am doing wrong. Note, I have had several breeds and issues over my almost 70 yrs but nothing like this. The other comments here have at least let me know I am not alone. I wasn’t looking for another dog when she came into my life. I’m wondering if she would be better off elsewhere with someone with far more patience and understanding at this point. What to do, what to do???? She is so cute Maryellen! 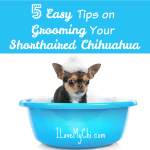 Maybe I should amend the article to say most long haired chis shed less than short haired chis. There will always be some like your dog who are the exception. Have you tried the furminator? It works great on dogs with heavy undercoats. You do need to use it at least several times a week (daily is optimal) to get it under control. My Chi sheds all over all the time and has a very thick under coat. She is now 12 and has always been very healthy and never any health or skin issues. I have fed her quality kibble from day one. I think some may just have thicker under coats than others. I use a flea comb before and after her bath time to help. She is so cute with those glasses on Lisa! Yes, some of them do have thicker undercoats than others. If you try brushing her everyday, you will cut down on a lot of that shedding. I do brush with a soft brush daily. This seems to help keep the hair count at home in check. Weekly we have a bubble bath and use the flea comb. She hates the furminator with a passion. She is also hyper sensitive to topical flea treatments. We started doing this to make sure we don’t end up with fleas and found that the comb was great at tackling the under coat. Yes I can see how a flea comb would be good with tacking the undercoat since it gets so close to the skin. I did find out that if you use the ‘defur’ process at groomer’s it only makes it worse. I brush at least once daily, usually in the evening. Which makes a Big difference. However, I also need to keep track of pollen counts etc. as I’ve noticed that it affects her. I’m assuming that the pollen gets hung up on her belly and works into the coat making her uncomfortable and extremely itchy as she starts to scratch like crazy. When that happens, I give her a bath with a natural shampoo and it really helps. Interesting that the groomer’s defur process makes it worse Mary. I think brushing daily and using a furminator is the best solution for most chis. I have heard pollen can do that to dogs if they have an allergy to it. I have my first chi, she’s 6 mos. Old and sheds terribly. I don’t know if she’s long or short haired. I’m really tired of the hair every where. It could be the changing of the seasons causing the excess shedding. Has she been checked by a vet? She might have something else going on. Brush her every day (preferably outside) and see if that cuts down on the shedding. I forgot to attach her picture, so here is my first chi, her name is Princess bc that’s what she is. She looks like a little princess. Is 3 and half month chi shed? My Chi shed and i notice some bald on her skin. Usually puppies that young don’t do a lot of shedding and there may be a health issue if she has some bald spots. I’d get her checked out by a vet. My short hair fawn Chi sheds a lot because we live in Florida and it is due to the heat. I brush him daily with a furminator, and bathe him weekly with a good quality shampoo for itchy skin. He is very healthy and look beautiful. 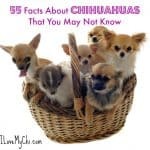 I was shocked that a tiny dog can shed so much, but I am informed by other Chi owner that theirs do as well. I got myself a Roomba robot vaccuum and it has helped a lot. My car is really suffering with the black interior and I have to clean it weekly. Worst of all is that I really can’t wear black any more! Yeah I hear you. I’d love to get a Roomba too! I’ve been using a grooming glove for the past few months and it’s working better than brushing. Plus the dogs love it. I do it outside (weather permitting) so no hair in the house.